There has been some discussion going on locally about the moratorium on the mobility fee. Abhishek and Katie will try to meet with the concerned groups and find out more information. These are some infrastructure projects that JBC can promote this year. – Activation of demand-actuated traffic signals by bicycles: Some intersections do not recognize a bicycle and won’t trip the signal to green. This leads the bicyclist to use a pedestrian walk if available. Some cyclists will run the lights. They are unsafe methods of crossing a street. We propose creating a list of most frequented intersections and increasing the sensitivity of the magnetic strip. Also, we propose painting an assistive markings on loop sensors. See more information here. – San Jose Bike Lane conversion: Chris LeDew has been taking charge of this initiative. This will convert some parking lanes on San Jose into A parking lane, 3 ft buffer, bike lane, car lanes. JBC would like this project to gain more traction. 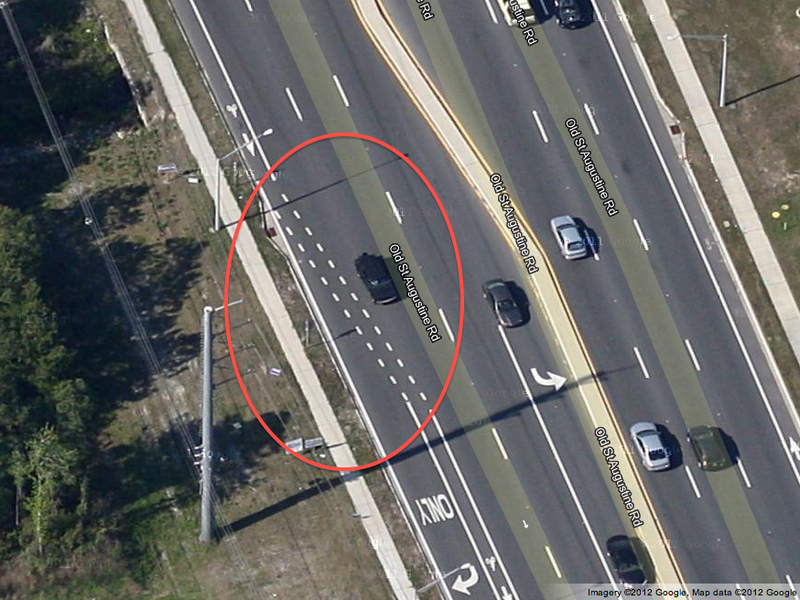 The bike lane on St. Augustine Rd shifts from the left side of the lane to the right-side of the turn-only lane. See map here. This type of transition is dangerous. It is difficult to navigate on a bicycle during rush hour. Cars are usually speeding from the outside lane straight into the turn-only lane. This type of bike-lane shift is a cause of conflict between motorized vehicles and bicycles. We would like to present this intersection to the BPAC. Our goal is to make this transition more accessible to cyclists, increase the subjective and objective safety. Once re-designed, we hope this intersection will increase ridership. –Issue: Bumpy roads make bicycling undesirable. Solution: repave roads. –Issue: Bike Boulevard to connect Springfield to Downtown. Solution: Possible Boulevards are Laura St, Market St, Pearl St. Status: Select one street, add infrastructure, signage etc. -Follow up on Riverside Ave re-paving initiative; push to include bicycle facilities on Riverside Ave. The RAP Transportation Committee meets once a month. 5. Recommendations for Councilman Gulliford. Question #1: Provide a list of recommended roadway infrastructure improvements. Question #2: Recommend some new regulations that the City of Jacksonville should consider with regard to cycling. Question #3: Provide specific suggestions and priorities as they pertain to enforcement and the rights of cyclists. Question #4: Provide specific suggestions and priorities as they pertain to the education of cyclists and motorists and the population at-large. Question #5: Identify all the various cycling groups in Jacksonville and their “chairman”. JBC intends to answer these questions to the best of our abilities. However, answering these questions may alleviate some short-term issues with bicycling in Jackosnville. We wish to propose the following to the Council to achieve timely and appropriate long-term positive effects towards that state of bicycling. -Appoint at-least one ful-time Bicycle Pedestrian Coordinator to coordinate bicycle infrastructure along with roadway improvement projects. This will ensure a continued involvement and focus towards bicycling in Jacksonville. -Conduct a thorough survey of the state of bicycling in Jackosnville. This will help establish a baseline state. Unless we can quantify what exactly is wrong with bicycling, we will neither be able to implement solutions effectively, nor know which solutions actually worked. Further, JBC members will be interviewing Bicycle Pedestrian Coordinators of various cities to see how they operate and what solutions worked for them. Bike-Fest is being organized in the Avondale area. More details forthcoming. ZenCog is celebrating it’s first aniversary at the Beaches location. Cyclocross season is about to begin.